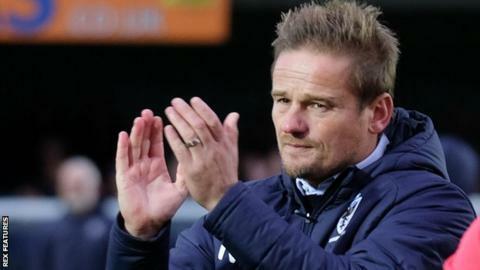 League Two strugglers Notts County have named former AFC Wimbledon boss Neal Ardley as their new manager. His appointment follows the dismissal of Harry Kewell on 13 November. Ardley, 46, was at the Dons for six years and led them to promotion to League One for the first time in 2016, but left on 12 November. Caretaker boss Steve Chettle stays in charge for Saturday's game at Morecambe and Tuesday's fixture against Carlisle with Ardley away on a family holiday. His first match will be an away tie against Sunderland in the EFL Trophy on 4 December. "Neal gave absolutely everything to Wimbledon in his six years as their manager and is deservedly enjoying a family holiday which he'll be cutting short in order to join us in the middle part of next week," County owner and chairman Alan Hardy said. Ardley takes over with Notts 23rd in League Two and without a victory in six league games, but the club have not confirmed the length of his contract. "Our biggest priority is preserving our proud status as the world's oldest Football League club and in Neal we have someone who knows what it takes to survive," Hardy added. "Neither he nor I are under any illusions it's going to be easy but we are both confident of achieving this very important aim. "His integrity, loyalty, passion and tremendous coaching qualities will all be valuable assets as we look to bounce back from our unexpectedly poor start to the season." Ardley is the third manager at Meadow Lane this campaign after Kevin Nolan began the season at the helm, before Kewell spent 10 weeks in charge. "There are few clubs who could have tempted me into such a quick return to management following what was obviously an emotional departure from Wimbledon, a club I love dearly," he said. "But the chance to manage Notts County is one I couldn't let pass and I will come back from my break fully refreshed and determined to drive us up the table."